Blackened rivers snake the ring roads of Beijing, carrying pollution and often smelly water from one end of the city to another. The most polluted of these have been dubbed “foul and filthy rivers” (黑臭河) by China’s Ministry of the Environment (MEP) and Ministry of Housing and Urban-Rural Development (MOHURD). However, the government has decided to clean these up – and it is enlisting the help of the public to do so. The Institute of Public and Environmental Affairs (IPE) is an independent civil society organization based in Beijing dedicated to the transparency and disclosure of environmental information. The group’s founder, former journalist, author, and 2012 recipient of the Goldman Environmental Prize, Ma Jun has written prolifically on environmental issues in China and created the country’s first pollution map database. IPE’s online air and water pollution maps use government data not only to show water and air pollution quality in every province and prefecture in China, but also to shine a light on specific emissions of factories, waste treatment plants, and factory farms. These days IPE is embarking on a new project to amplify a unique MEP and MOHURD crowdsourcing initiative that aims to tap citizens in Beijing to identify the foul and filthy rivers in the city. The government has set targets for cleaning up the capital’s worst waterways: by 2020, the percentage of waters in built urban areas designated as “foul and filthy” must be contained to less than 10 percent and cleaned up completely by 2030. MEP and MOHURD kicked off this undertaking just after the 2016 Chinese New Year holiday by publishing the names and detailed statistics about the water bodies designated for clean-up. IPE has since integrated this information into the new 3.0 version of its Blue Map app (created by IPE to provide information on pollution) that will launch later this month, allowing the public to see exactly where these polluted waters are located. But this initiative is not only about making information available to the public – it also capitalizes on the power of citizens to assist in clean-up efforts. To that end, MEP has opened a public account on We Chat (a wildly popular Chinese app that is a cross between What’s App and Facebook) where the public can submit photographs and descriptions of any waters that they believe should be designated as “foul and filthy,” guaranteeing that each report will receive an official response in seven business days or less. Meanwhile, IPE’s revised Blue Map app includes a “foul and filthy river” module; more than 3 million users have downloaded the app and, hopefully, even more users will download the new version once it is released. 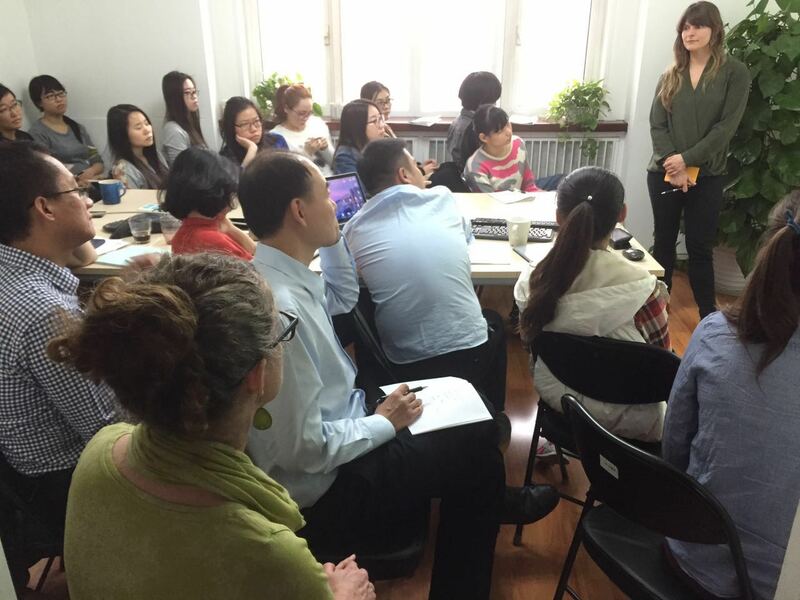 The Commons Lab in collaboration with the Wilson Center’s China Environment Forum gave a series of lectures and workshops on citizen science and communication techniques in Beijing two weeks ago. First, we introduced the citizen science field to 13 small environmental and health NGOs based in Beijing and western China. Then we stopped off at a hip bar in downtown Beijing to present to a room full of energetic Chinese and foreign energy and environmental workers of the Beijing Energy Network (BEN). Our last stop was Renmin University, where we discussed the potential for citizen science in natural resources. 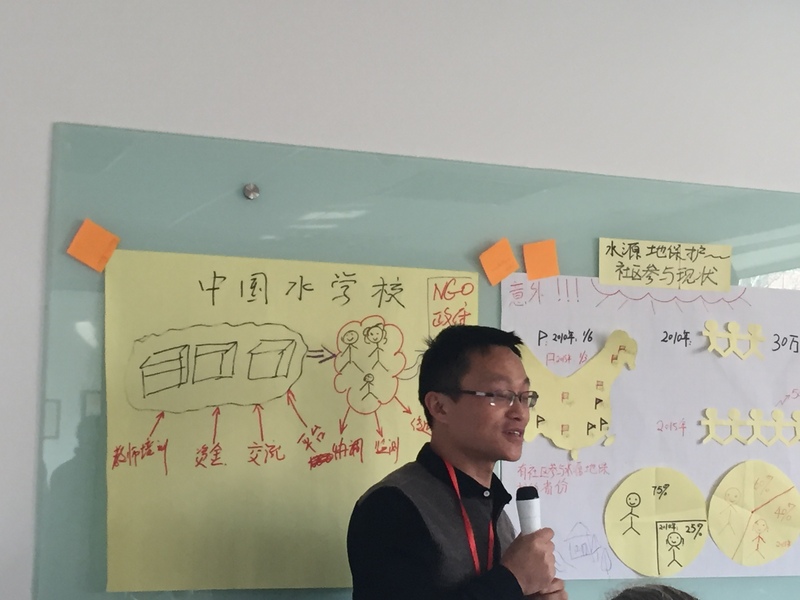 The feedback was tremendous and it’s clear that citizen science is growing in China and organizations are eager to expand their public participation in environmental issues. Global Environmental Institute presenting on one of their citizen science project ideas. The Beijing-based Global Environment Institute is developing a climate change monitoring and adaptation citizen science pilot project in Western China, in the Sanjiangyun (Three Rivers) Nature Reserve in Qinghai Provence. This remote region provides drinking water for 1.4 billion people and contains fragile, yet critical, ecosystems. Information about the state of this environment is difficult to obtain due to its remoteness, and the region is only visited by the nomadic residents. This project aims to train the semi-nomadic herders how to monitor their local environment so scientists and environmental policymakers can make decisions based on more accurate and real-time data. Botany wins for the longest standing citizen science project in China. Run by a collaboration of researchers from the Chinese Academy of Sciences, this project encourages naturalist enthusiasts to record observations of plants, and submit them the researchers which are then uploaded to the Global Biodiversity Information Facility. It also serves as a discussion forum and RSS feed on relevant citizen science work from around the world. Finally, the Chinese Water School is a primarily educational project run by the Chinese NGO Shangri-la Institute for Sustainable Communities based in the mountains of Yunnan Province in southwest China, which educates teachers how to collect water samples who then teach their students. The Ministry of Education in China administers volunteer certificates for children who participate in activities outside of their school. It was suggested during the BEN talk that a citizen science certificate could be created to encourage student participation in projects like these. Not surprisingly, a lot of the challenges facing the projects here in China are similar to those faced by other countries: lack of funding, cracks in the project-to-decision-making pipeline; data quality standards vary across different projects; lack of interoperability of the collected data; and little knowledge about other projects. However, China is lucky in that a number of these projects are still growing and some of the project ideas have yet to create databases, so the opportunity to build these with interoperability in mind is still wide open. Despite the differences in Chinese policy and governance from Western countries, it appears as if the Ministry of Environmental Protection is eager to involve the public in solving environmental problems and environmental information is becoming increasingly available thanks to third party institutions like IPE. Through engaging the local and provincial governments, these nascent citizen science projects can encourage the use of their data and analysis by the MEP in collaboratively solving China’s environmental problems. Previous Post Is citizen science living up to the standard?